Death means the separation of the soul from the body. Every soul must taste death. Death is the end of the earthly life of man and his actions and the beginnings of the hereafter. Man is on a journey on earth. When man dies all his actions are ceased and he has the eternal life hereafter. The most precious treasure for man is the life on this earth. Earthly life is only a trial and examination for the preparation to enter the eternal world. This life is a home for our deeds and hereafter is the home for rewards. Human beings enjoy a significant status among all the creatures on earth. Man is a trustee of God on earth, and gifted with intellect and reason. Man is given with the freedom of action on this earth. Imagine if there was no Human existence on earth then who could have reaped the benefit of this bountiful earth. Man therefore has a definite purpose for his existence on earth and he is responsible and accountable for his actions to his Creator. Normally, we understand that there are three stages in life. Birth, Life and Death. But Islam explains an astounding truth of permanent life and no death. In Islam we find there are six stages in life. * The first stage of an individual's life is prior to birth i.e. in the mother's womb. * The second stage is after birth. This is the most important stage of one' life. We are obliged to lead a meaningful life. This life on earth is for actions and the preparation for the life hereafter. * The third stage is death, which is only a break in life and end to all actions. At death all actions of man are ceased and it is the beginning of the Hereafter. * The fourth stage is after death. This stage begins after death and continues till the Day of Judgement. This is an interval period called Barzakh. 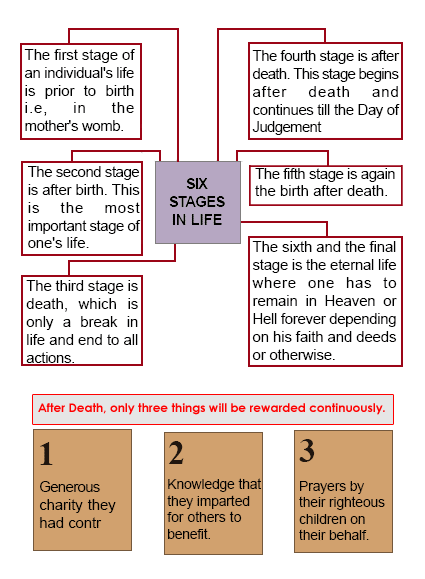 * The fifth stage is again the birth after death. 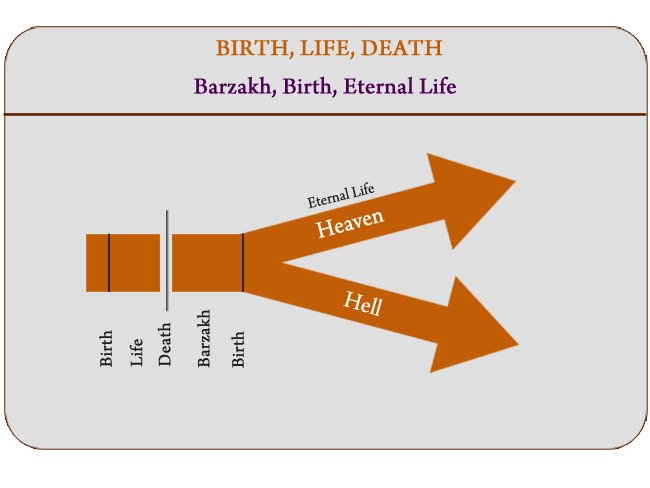 * The sixth and the final stage is the eternal life where one has to remain in Heaven or Hell forever depending on his faith and deeds or otherwise. The belief in the Day of judgement, resurrection, Heaven and Hell are the basic articles of faith. One who is rewarded with Paradise in the eternal life is really a successful person. The concept of hereafter and the strict accountability of one’s actions after death play a vital role in the reformation of one’s life. The major shift of paradigm should be towards the life of submission to the will of God and attaining paradise in the Hereafter. The best way to use life on this earth is to put into practice the guidance from the Holy Quran and teachings and practices of Prophet Mohammed (PBUH). The Fifth Principle “Understand Death is not the end but a break in life and end to all actions” gives enormous enlightenment and meaning of our existence. Come, join the quest for true success! Get set for a paradigm shift in your personality, thought and action towards Islamic message.